Although KantaKantun is officially over, the journey for local musician and composer Alex Vella Gregory is not over. From start to finish, he fills us in on his experience on this exciting and innovative project. Words by Alex Vella Gregory. 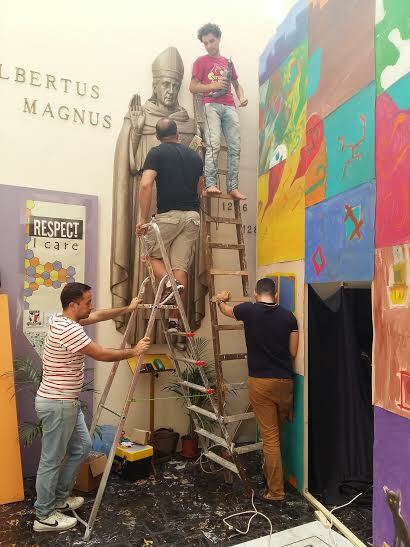 The Valletta team setting up their installation. And so it is officially a wrap! KantaKantun has been an amazing journey. Over the past year, we have worked together to create an experience for everyone involved! I remember a year ago Charlo (who took care of the architectural elements in the project) was slightly wary of getting early Secondary School students to talk music and architecture. I didn’t show it at the time, but even I was a bit terrified! What if they got bored? What if they found it too easy or too difficult? What if we ended up stapled to the school notice board upside down covered in paint? Well…that didn’t happen. Something did happen though, and that was the creation of new bonds with all those involved. The last part of the project was the most difficult one for the team. The two schools (St Albert the Great College, Valletta and Gozo Secondary School) swapped the recordings they created in the second part of the project. Each group listened to the music and commented on the possible inspiration for the soundscape. They then proceeded to draw images and designs for a structure that would best represent that soundscape. From those images, the team created an installation for each school. There were a lot of common traits in both installations, mostly a sense of the past and the supernatural (ghosts featured quite heavily!) However, the Gozo students had a greater sense of open space and the countryside, whereas the Valletta students were more dominated by the built environment. The Gozo installation took the shape of a Greek cross topped by a dome all covered in transluscent fabric. The Valletta installation ended up as a towering installation four metres high consisting of a cuboid structure with black fabric in the middle. In each case, the surfaces were all covered in designs taken from the students’ sketches. It took a total of 12 large bottles of poster paints for each school to decorate the surfaces, but in the end they did. At St Albert the Great College (who had an impressive 48 metres squared worth of designs to paint), they even roped in the Art classes! These installations are now in the foyer of the respective schools for all to enjoy, and will eventually move to another more public exhibition space after the end of the scholastic year! At this point, (at the risk of boring our readers) a few thank yous are in order. Firstly I would like to thank the Valletta 2018 Foundation, not only for believing in this project but for their unwavering support. A huge thank you goes to the two schools, especially the Heads of School Mr Mario Mallia (St Albert the Great College) and Dr Francis Abela (Gozo Secondary) for believing in this project and accommodating all our needs and requests. With each school came a whole team of people from the school side, and I confess I cannot mention them all by name mostly because I have an awful memory! But I will mention Ms Suzanne Gatt, Mr Carlo Fenech and Ms Sarah Camilleri from St Albert the Great College, and Ms Isabel Said from the Gozo Secondary School. They were all simply amazing. 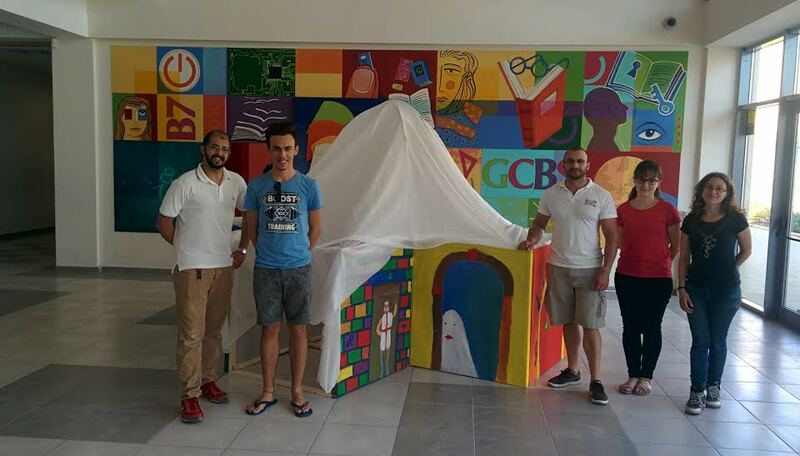 Alex Vella Gregory with the Gozo team and installation. Then of course there was the design team from Outlook Coop – Mario Caruana and designers James Camenzuli and Naomi Gatt. Not only did they ‘get’ the project immediately, but they also produced some fantastic art work! The KantaKantun team also had a team of six helpers: Samuel Mallia, Ivan Giordano, Liana Agius, Amy Rapa, Karl Camilleri, and Glen Montanaro. Without them we would not have managed to carry out the project successfully, plus they were awfully great fun! Then of course there was Charlo Briguglio, Junior Architect and the guy who took care of the Architectural side of the project. He was the one who kept things grounded and realistic when I was too much into the creative side of things. Last, but not least, the biggest thanks goes to the students themselves. They were amazing all the way. They listened and commented, very intelligently I will add. They all sat through music by Debussy and Xenakis without as much as a giggle or a sigh. They created soundscapes which were far beyond my expectations in their creative vision, and they continually challenged us to see the world differently. The actual project might have come to an end, but the journey continues for all of us. All I can say is: ’Thank you all, it was beautiful’.